Insurance Planning for Medical Residents. “Hi, I am Fred with Insurance Brokers LLC, and I would like to thank you all for attending today. I am a financial planner that focuses on insurance for medical professionals, and we ONLY work with physicians like you.” Then he drops that awkward wink at you while you are destroying your turkey club. Okay, let us pause for a minute and analyze the tape. Problem 1: Evidently your school did not research this person walking in the door, and that person may or may not take advantage of young medical professionals. Problem 2: Almost every insurance salesperson will call themselves a “financial planner” because if they would put their real title of “Insurance Salesperson” or “Insurance Broker,” most would run towards the door. Problem 3: If they focus only on insurance, they are probably not a true financial planner. Problem 4: The turkey club is not an issue. So indulge! Stay for the presentation. Most of these salespeople provide a free lunch (they want as many people as possible in the room). Remember, you are on a resident’s budget so take advantage of the free meal! Heck, throw an extra sandwich and cookies in your bag on the way out. If it sounds “kind of” legit, go do some research. Call another advisor and ask for their opinion. Check out sites like The White Coat Investor or Physician’s Money Digest. Not only can you see what other medical professionals are saying, but you can also see what other financial professionals are saying. Now that you got a free lunch(s) and said no to the insurance salesperson, what should you do next? You most likely need insurance, but you probably don’t need to be paying for permanent life insurance which is usually much more expensive than term insurance. Besides malpractice insurance, your two main coverages should be disability insurance and term life insurance. Let’s walk through these two in more detail. Before you worry about life insurance, you should focus on disability insurance. Why? Simply put, this protects your income today and for the rest of your working years. You just went to school/residency/fellow for 12+ years, if you wake up and can’t go to work, you and your family are in trouble. Also, if you have private student loans, your provider will typically not care if you become disabled and still require payment. Disability insurance is important for numerous reasons. Usually, your hospital for residency/fellow should offer some type of group coverage for you. For example, 60% of your income up to $5,000/month. If available, always take advantage of that. It may be fully paid via your employer, or they will offer you a group rate. If you need to, pay for the coverage via the group rate. Group rates are usually cheaper than a private policy. While that is better than nothing, you should search the private market for a disability insurance policy to supplement what you already have in place from your employer (if you have anything in place). Is there a discount rate for your hospital? Or do they offer unisex rates? Most of the time if you have enough people from one hospital that purchase disability insurance, they will provide discounted rates and/or unisex rates. Unisex rates are important for women physicians because their premiums are usually higher. The unisex rates will lower the premiums for women. There are some fancy terms/riders to add to your policy, but do NOT let the insurance agent attach every rider possible without you knowing the specifics of each benefit. Most riders will increase your premium and increase his/her commission. Each rider should have a particular need. First, look for a non-cancelable/guaranteed renewable policy. You will also want to look for an own-occupation policy (each company will have a different definition of own-occ so read the fine print). This is what you should be looking for with own-occ, if you’re a surgeon, but can no longer perform surgery; you will still be paid. Even if you can become a professor earning six figures, if you can’t do surgery, you are getting paid from your policy. Own-occ is also labeled as, “specialty-specific” or “tier 3 coverage” sometimes. Other notable riders include residual disability, cost of living and catastrophic coverage (usually inexpensive and worth it). If you are a young physician with many pay increases ahead of you, make sure your policy has a guaranteed future purchase option. This rider will allow you to increase your insurance benefit amount by showing your increased pay via tax documents or pay stubs. The best part is that you don’t have to answer any medical questions or prove insurability. For residents and young attending physicians, disability insurance is vital. Just make sure you do some research or ask a professional (or two). After you have your disability coverage in place, then you can look at term life insurance. Don’t be sold on any permanent insurance as a young medical professional. At WealthKeel, we do use whole life insurance in certain situations; however, it is with physicians that are well into their working years. They have no student debt (or any debt for that matter), they have maxed out their 401k/403b and their Roth IRA, and are looking for a tax shelter for tax-free income in retirement. Each physician we work with has a different situation and different life circumstances: married vs. single, kids vs. no kids, mortgage vs. rent, student debt vs. debt free, and each event affects your need for life insurance and the amount. Term insurance is inexpensive because 98% of term policies are never used. That’s fine with us. We are just locking in your insurability while you are young and healthy. As your income increases, you can then convert any amount of that current policy to permanent insurance without having to prove insurability, if needed. For young and healthy medical professionals, a 20 or 30-year term insurance policy for $1,000,000 in coverage can range from $40-$80 a month. That premium should be less than any permanent life insurance premiums, most likely much less. Things to look for in a term insurance policy: Make sure the company is credible. Look up or ask for their Comdex score. It is an aggregated total of all their financial ratings into a simple system of 0-100. You want to look for a 90+. Make sure the term policy is convertible to all of that company’s permanent products. Last but not least, it is usually a good idea to add a waiver of premium. It is inexpensive, and if you were to become disabled, you would not have to worry about paying your term insurance premiums. Term insurance doesn’t require too much thought or homework. Look for these few simple items, do your research, and ask the right questions. Insider tip: Ask your advisor for a copy of their spreadsheet. They should have quoted numerous insurance companies. Find the best Comdex score with the lowest premium and you should be using them. If not, ask your advisor why he/she is going with a different policy. 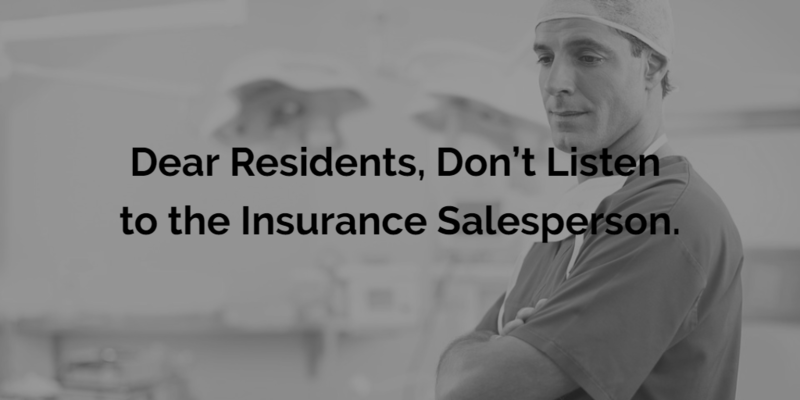 Don’t buy permanent insurance as a young medical professional, and don’t take advice from a “financial planner” who may be an insurance salesperson hiding behind a fake title. Consider buying term insurance after you have disability insurance in place. The world is a tough place, and the financial world is even harsher. Do your research, ask questions, and don’t assume anything. If you feel like you’re being taken advantage of, send me an email, ChadChubb@wealthkeel.com. It is time to reform the financial world, and it can only be done with proper education and calling out the non-fiduciaries.